Parrish Farms took a small break from showing this year 2018 until recently and we attended the Mississippi Valley Fair. It is always a great show with many friends and awesome people. there we took Grand and Res Grand Sr doe, as well as Grand and Res Grand jr doe, then on to win Best JR doe in Show with Parrish Farms LEG DeeDee- jr kid on 8/4/18. We will be starting 305-day DHIR testing with ADGA and AGS this year in 2013. In 2015, we will be doing DHIR Standard testing again with ADGA and AGS as well as LA and we are signed up for ADGA Plus!! 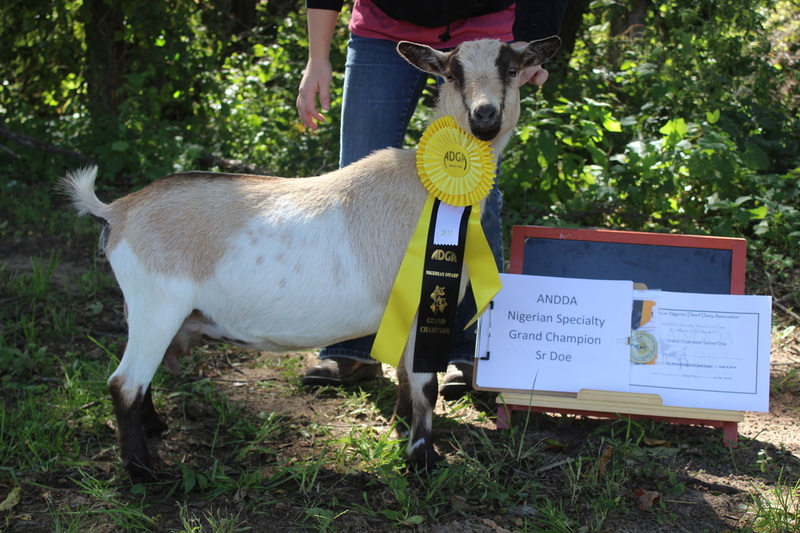 In 2016, we are on our second year of ADGA Plus, ended up getting all Nigerian Bucks DNA tested and 2 Nubian Bucks DNA tested along with G6S on them, DHIA for our 4th year, and LA for our first year. *2018, We will be doing DHI and LA if they can fit us in. possibly showing only a couple shows this year. 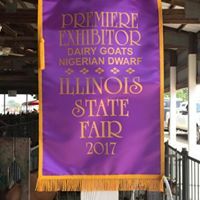 We are super proud and excited about our many accomplishments that we have made in just the 7 years of raising Nigerian Dwarfs. Please see the Nigerian Breeding schedules for putting down your deposits on kids from the breedings. Deposits can be made by Cash or PayPal only, payment in full in cash or paypal only. Please also see the Sales Policy Page before making a purchase. There is information about where to send the paypal payment and deposits as well on there. MCH/CH Pelican Acres LPD Fern - 2yr old FF with a single. Picture is of Me with : CH Parrish Farms ABA Pappy Snap at the 2013 NGE he was 1st place yearling buck and Reserve Grand Champion buck winning his restricted leg, since the champion was already permanent!! 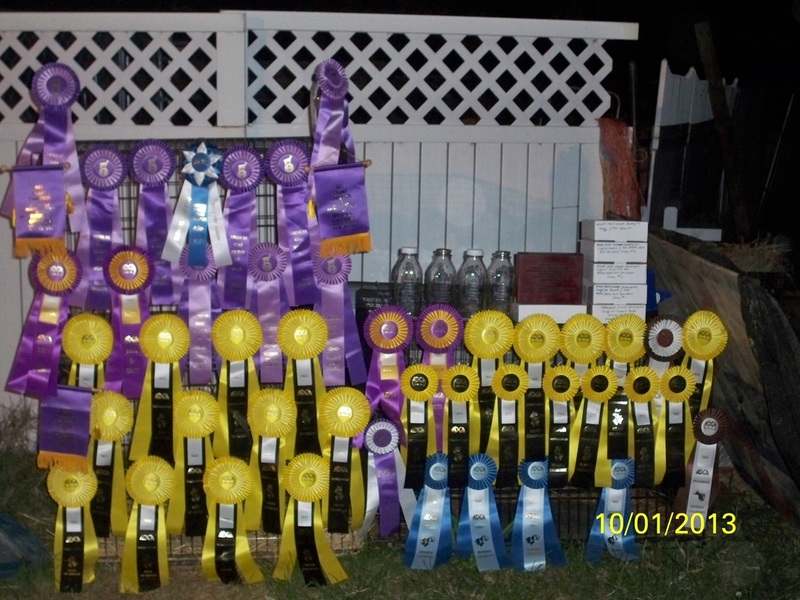 Parrish Farms Winning Rosettes and banners from the 2012 National Goat Expo for AGS Nationals, NDGA Nationals, NDGA Emilie Hamman show, NGE NDGA show, NGE ADGA show. 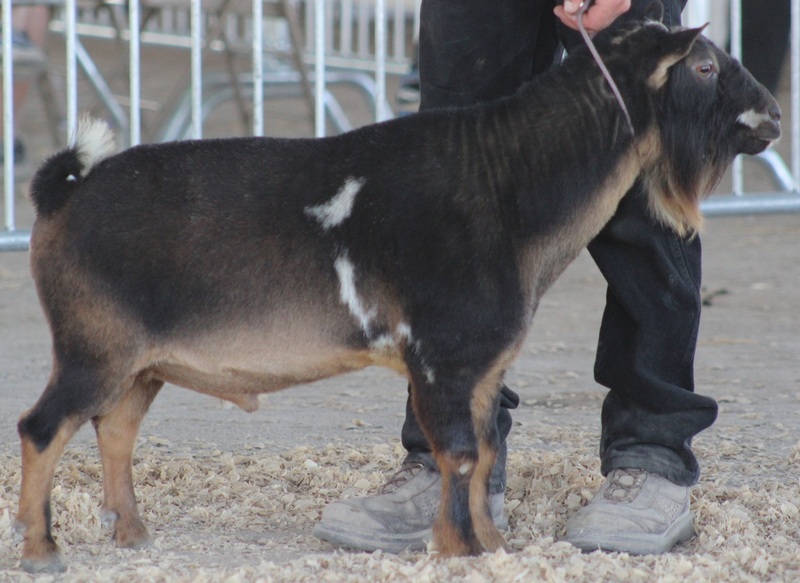 CH Parrish Farms ABA Pappy Snap won his final 2 legs at the 2014 National Goat Expo.. this 2 yr old buck is one of our best buck kids to hit the ground an i knew he was going to be a champion since he was a couple weeks old he just had that drive and personality to him he is our 1st home bred Permanent champion!! 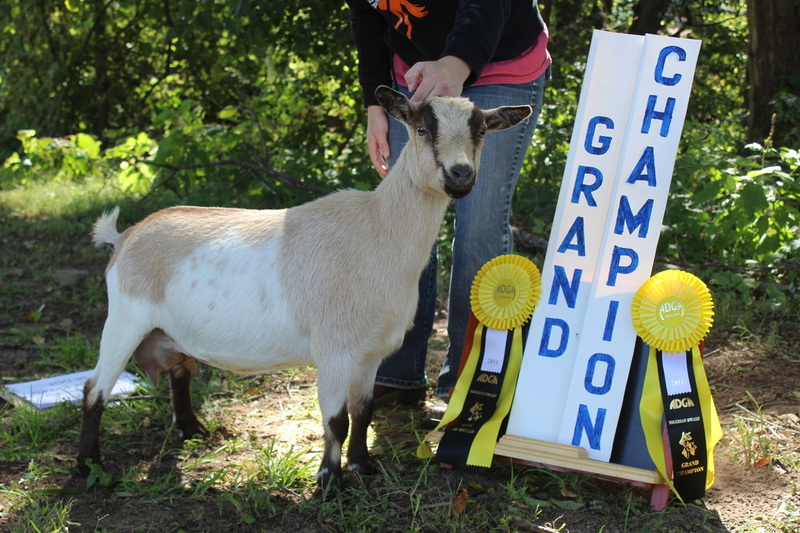 Reference Picture of the of 2012 NDGA National Grand Champion Jr Buck - My Country Hill RMM Maxim (my Heritage Acres T Little Rowdie) - at his new home in Kentucky. Parrish Farms is based out of the rural town/village of Oquawka, Illinois. 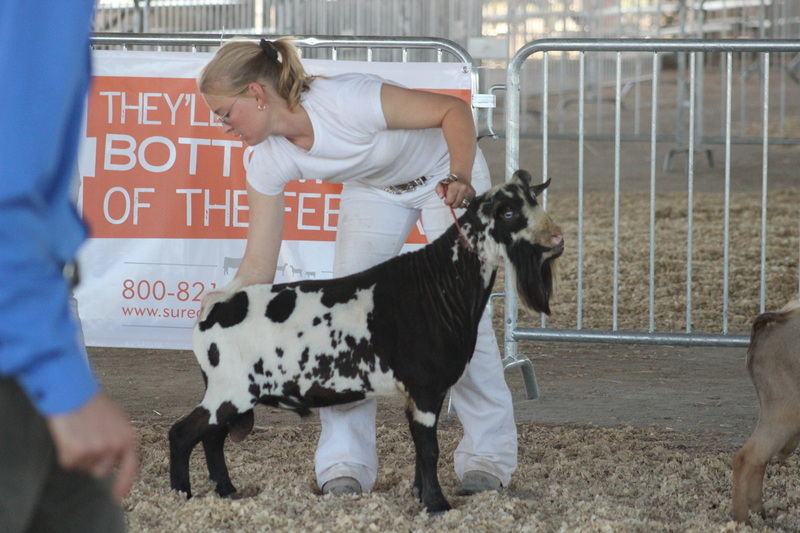 We have been raising goats since January 2009 and registered stock since 2010. The farm consists of Registered Show, Milk, and Breeding Quality Nigerian Dwarf Dairy Goats (ADGA & AGS), our Lab/Pyr Cross Pup (Villa), and 4 outdoor cats (Tasha, Beijing, moonie, blackie) and 1 inside kitten (Baye- Jayedynn's kitty), we lost our English Mastiff Rocko and Rosco our cat this spring, RIP our big boy and one of my favorite cats of all time. The owners of Parrish Farms are Jennifer & Jayedynn Parrish. Jennifer graduated from Iowa State University in May 2008 with a B.S. in Animal Science and a B.S. in Dairy Science and is the one who runs, owns, and manages the farm. 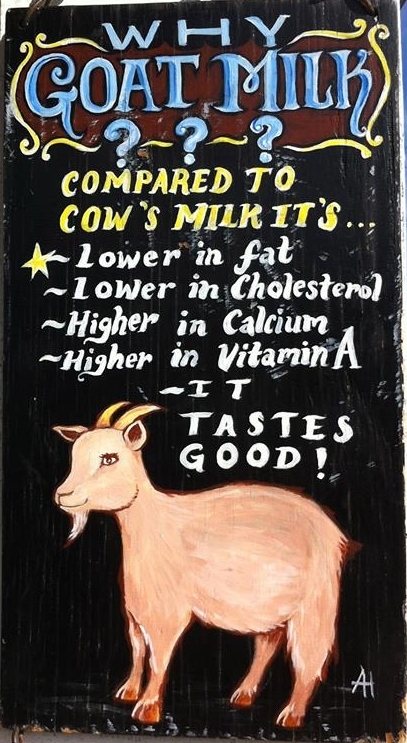 Jennifer is also a Nutritionist specializing in goat nutrition with her own lines of goat feeds. Jennifer also works with dairy and beef cattle nutrition, PNP Nutrition. 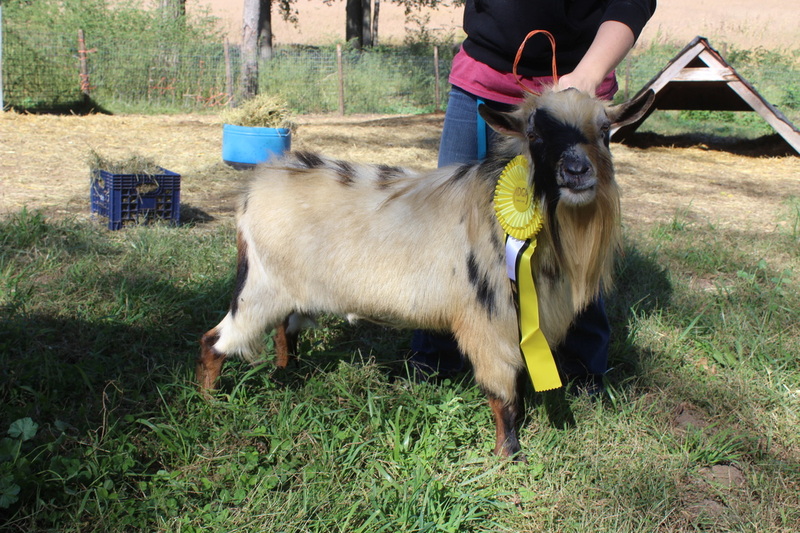 ***At Parrish Farms we strive for excellent health/nutrition of our stock with healthy coats, good kiddings, fast cleanings, vibrant kids at birth, and fast growing and healthy kids. The goal for Parrish Farms is to hand select genetically and/or phenotypically superior animals for our herd. Herd sires are selected with an animal mating system in mind to make the next generation as improved as possible. Parrish Farms emphasizes structural correctness, maternal traits, balance, and superior pedigrees. CHAMPIONS AND AWARDS GIVEN TO OUR STOCK!! ^^ most of our girls we milk tested this year in another short lactation earned their milk stars and some even earned their AR, so happy with the way our herd is progressing and the udder and milk our girls have. ARMCH/CH VIKING'S BATMAN RETURNS +S- Batman is now AR in AGS having 3 AR daughter who earned their milk stars and their AR, I am so happy all my hard work is finally paying off, so wish i still had this boy here, i miss him every day!! Most of our does earned their milk stars on our short lactation due to my pregnancy issues and having our daughter. They earned their stars on one-day milk test in May. All the other girls besides Prudence has already earned their milk stars in previous years, prudence had a really amazing udder and great production just missed earning the star. August 3rd, 2013 - Mississippi Valley Fair- 1st place Dam & Daughter, 1st Place Best 3 jrs, 1st place Jr Get of Sire, 1st Place Produce of Dam, Grand Champion Nigerian Doe, Res Grand Champion Nigerian Doe, Jr Grand Champion Nigerian Doe, BOB Nigerian Doe, Grand Champion Toggenburg Doe, BOB Toggenburg Doe. Judge Jay Rudolph. 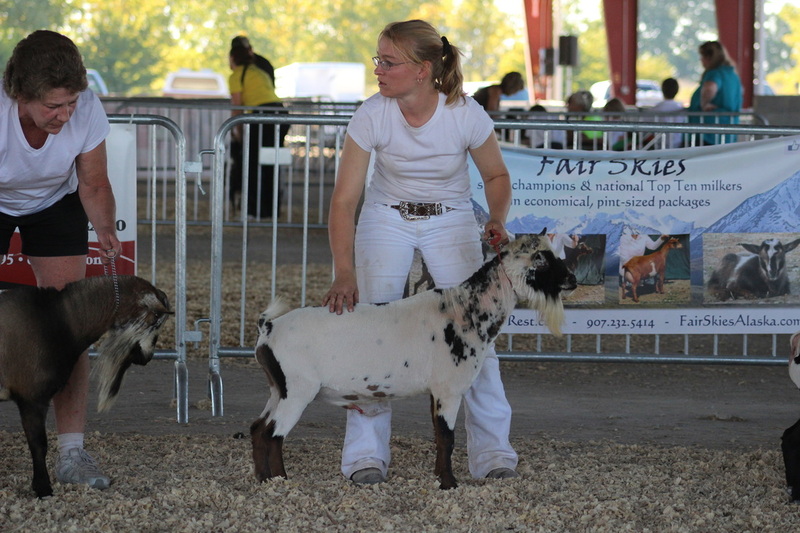 August 3rd, 2013 - Parrish Farms KAP Guinevere picked up her 1st Res Grand placing at the MVF. 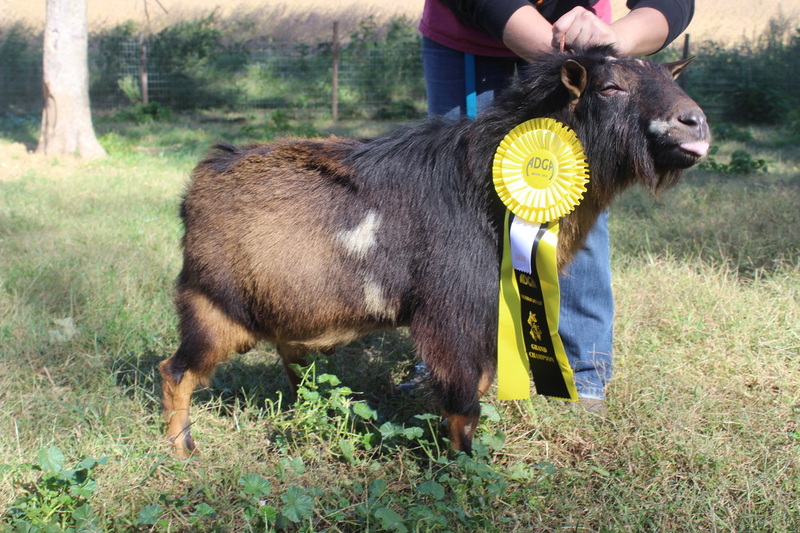 May 18, 2013 - Helmstead Minis Flames Foolery Earned her Jr Grand Champion Restricted Leg with ADGA. 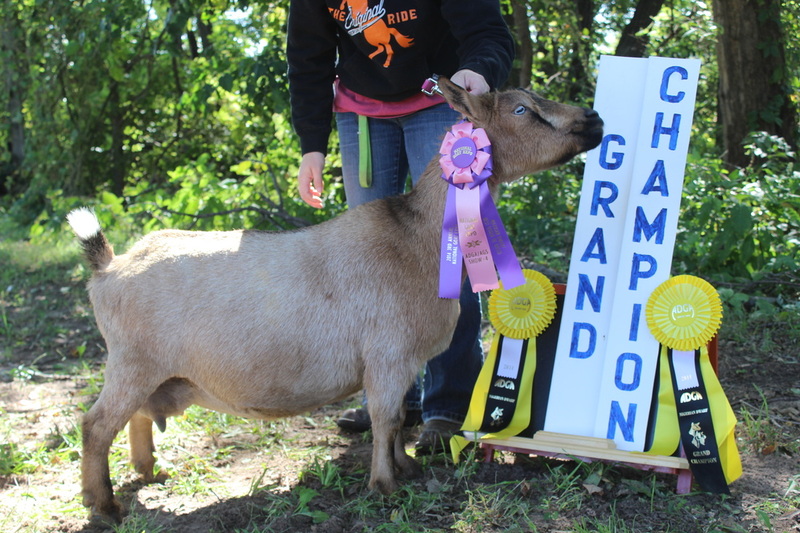 June 2013 - Viking's Batman Returns picked up his 1st ADGA & AGS leg at LadySmith Show in WI with Josh Kaplewski as the judge and 1 Res Grand with Jay Rudolph. 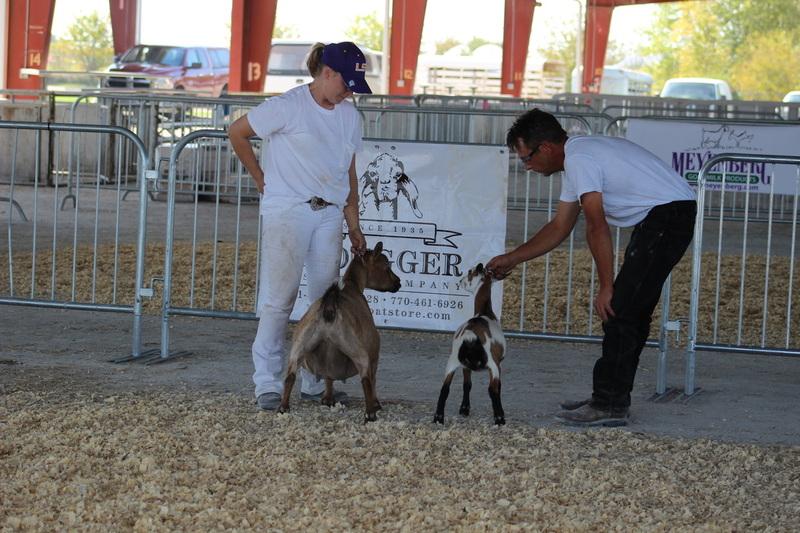 June 2013 - Parrish Farms Paige- picked up 2 Jr Grand Championships at LadySmith in WI.